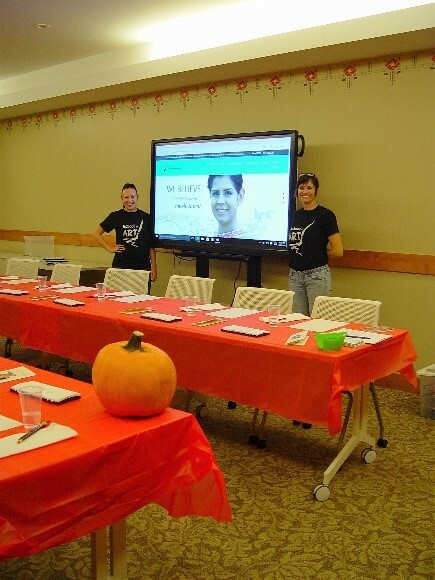 The Alyssa Alvin Foundation for Hope (AAFH) held another Art Night at the Ronald McDonald House (RMH) in Winfield on September 22, 2016. Jennifer (Jen) Siracusano, Owner and General Manager of the School of Art, and Amy, one of her staff members, sponsored the ink and watercolor art activity. We thank the School of Art for their talent, time and art supplies donated for this art activity. We had families from Westport, IN, Plain City, OH and Elgin, IL who participated in the ink and watercolor art activity with Amy and Jen. It was great seeing the children’s smiles and the moms and dads get involved in drawing and using watercolors to create a Halloween pumpkin. We all shared a fun and relaxed evening. We continue to share Alyssa’s love of art with the families staying at RMH and we hope to continue bringing them more joy and hope in the future!